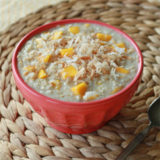 Steel cut oats simmer with coconut milk until luscious and creamy. Stir in some fresh mango and top with toasted coconut for pure heaven. Bonus: it’s vegan! The coconut milk and vanilla lend the perfect touch of sweetness (but not too much!) – you can add a little sweetener if you like. We’re into our hearty breakfasts around here. What’s the saying? Eat breakfast like a king, lunch like a queen, and dinner like a pauper? We do pretty well on the first two, though generally we eat dinner like kings again. I guess we like our crowns. Breakfast, though, that’s a biggie. Especially now that the little one is in the mix – just from pure instinct, breakfast is her largest meal of the day. Breakfast is also nice for our mixed-diet family because it’s generally pretty easy to please both the vegetarian and the meat-eater. Oatmeal and other hot cereals, for one, make for a plenty rib-sticking breakfast but it wouldn’t occur to most meat-eaters to put meat in theirs (unless you do savory oatmeal, which I think is something I really need to try). My guy is plenty happy with a couple token slices of bacon alongside egg dishes and a couple slices of toast, and frankly, Morningstar veggie sausages are so, so good if I really want to go there myself. Today, though, it’s about the oatmeal. 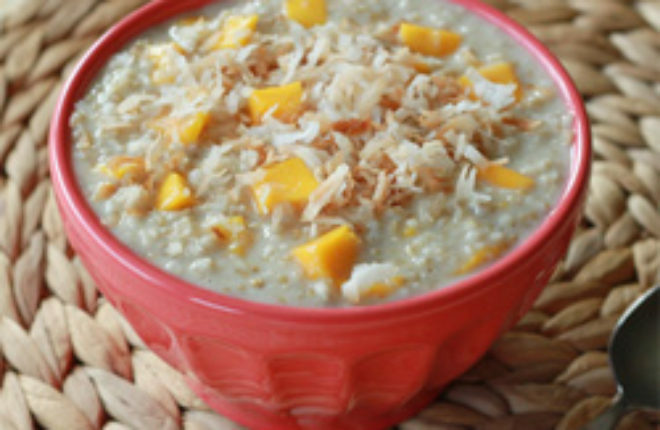 This utterly creamy mango coconut oatmeal is lightly sweet, super hearty, and reminds us of vacation. Oh, and it’s vegan! 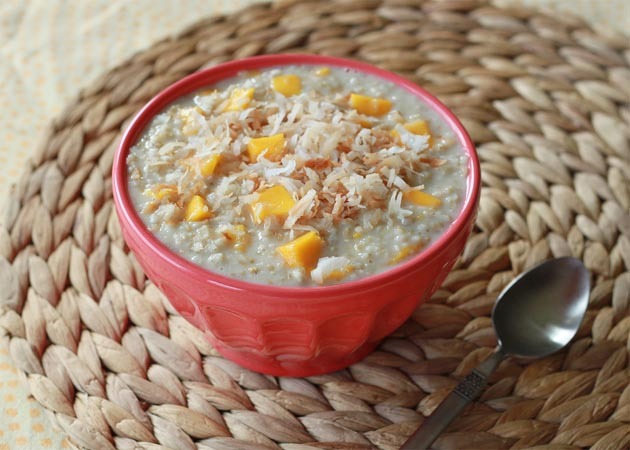 Simmering the steel-cut oats in coconut milk is what makes it extra creamy. This oatmeal is just luxurious tasting enough to feel like dessert. I’d say that’s just about the perfect breakfast – royalty or not. Preheat oven to 325 degrees. Spread the coconut onto a cookie sheet and bake for about 5 minutes, stirring occasionally to ensure even toasting, until the coconut is golden brown. Remove from oven and set aside. 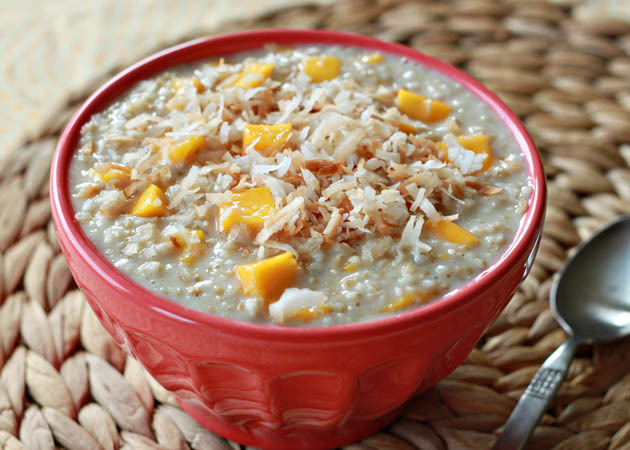 Place steel-cut oats, water, light coconut milk, and salt in a medium-size saucepan over medium heat. Stirring occasionally, bring ingredients to a boil, then reduce heat to medium-low and simmer for 20 minutes until thick and creamy. Stir in mango and vanilla extract. Taste for sweetness, and add sugar if desired depending on your individual tastes. Thanks, Kalyn! Hope you have a fabulous long weekend. Thanks so much, Lisa! Aren’t mangoes just magic?! sounds delicious! would this work if made and then kept in the fridge for a couple days of breakfast? Hi Zarina, I think this would keep fine in the fridge! You might just want to add a bit of water or more coconut milk before warming it back up as it may dry out a bit in between time. Could this be crock pot friendly?? Hi Johna, probably! I’ve not had great success with coconut milk or dairy milk in overnight Crock Pot oatmeal (it has a weird, almost scalded taste in the morning), so my suggestion would be to increase the water to about 3 1/2 cups and then stir in about a 1/2 cup coconut milk in the morning, maybe letting it cook for another 30 minutes or so to warm it back up. It won’t be quite as creamy, but then again overnight Crock Pot steel cut oats can turn out pretty creamy just because they simmer for so long overnight. If you try it, let us know how it goes (and I’ll have to give it a whirl too)! Delicious! No additional sweetener required at the end – and I normally put sugar in everything. The coconut milk, vanilla and mango make a creamy and perfectly sweet combination. This looks great! I have to make something for a work breakfast potluck and thinking about maybe overnight via crockpot or perhaps just refrigerating the way you made it and heating it up in the morning. Any advice? And could I do canned mangos? I know it’s not the best but wish they were in season. I’ve found Crock Pot oatmeal can take a lot more liquid – and any time I’ve tried using milk or coconut milk in Crock Pot oatmeal it’s ended up with a weird taste. So I vote for option two! Heck, you could even make it, refrigerate it, and then keep it warm in the Crock Pot at the Crock Pot? Best of both worlds! This was absolutely delicious! I made it as a post-run meal and it was perfect. Even my sister, who hates steel cut oats, enjoyed it. I was afraid the creaminess would be overwhelming, but it was not. I used frozen mangos instead of fresh. This recipe is definitely going in my breakfast rotation. Thanks so much!